Welcome to our digital archive! To begin searching the archive, type your search term in the box at the top of the page and click the magnifying glass, or choose the SEARCH or BROWSE options from the menu. Our current collection includes issues of The Register and The Barnstable Patriot, as well as issues from other titles assumed by those periodicals over the years. The Register was first published in 1836. It covered Cape-wide news, regional stories, and national news. Its special focus was on Dennis, Yarmouth, and later Barnstable. The digitized collection covers the years 1836 to 2017 and includes issues of Dennis-Yarmouth Register and Yarmouth Register. 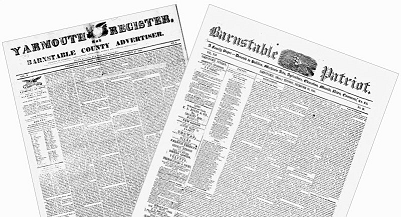 The Barnstable Patriot began publication in 1830. The Patriot is the oldest continuous newspaper in Barnstable County, Massachusetts, and the seventh oldest newspaper in the United States. It also covered Cape-wide, regional, and national news with a special focus on Barnstable. The digitized collection covers the years 1830 until 2017 and includes issues of The Hyannis Patriot and Sandwich Observer. In the 19th and early 20th centuries, the two newspapers had varying political opinions and editorial points of view. Therefore, the two papers complement each other and provide a full balance of Cape Cod news and history. We extend our heartfelt gratitude to the Community Preservation Committees of the towns of Dennis, Barnstable, and Yarmouth for funding this project and to the Institute of Museum and Library Services (IMLS) and the Lothropp Family Foundation for their partial funding of the digitization of The Barnstable Patriot from 1830-1930.